Driving directions : From Seoul Station, take a train to Miryang (밀양). From Miryang Station, take Bus 2, 2 Cheongun (2청운), 2 Chodong (2초동), 3 Sangdong (3상동), 6, or 6 Hwalseong (6활성). 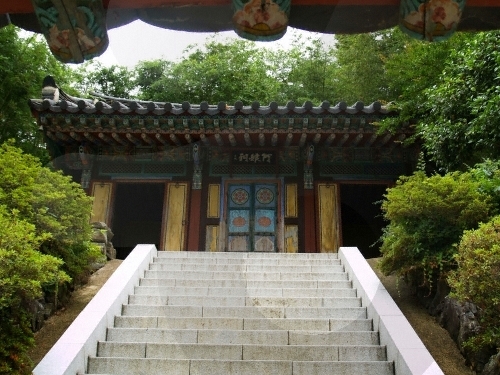 Get off at Yeongnamnu Pavilion (영남루입구). Go towards Yeongnamnu Pavilion (영남루) for 150m to arrive at Aranggak. Located in Naeil-dong in Miryang, Gyeongsangnam-do Province, Aranggak Pavilion sits in a bamboo forest. It is said to have been built to appease the spirit of a young woman named Arang, who met an unfortunate death. According to legend, Arang was mistakenly killed by a low-ranking officer who had loved her and tried to hug her. After her death, she becomes a ghost and appears to every district magistrate (highest-ranking officer in a region) to appeal for the investigation of her unfair death, but each district magistrate dies of a heart attack. Then, a new district magistrate by the name Lee is dispatched to the area. Unlike his predecessors, Lee listens to the story of the ghost and finds the low-ranked officer who had killed her and punishes him. He found Arang’s body and holded a religious ceremony on her behalf. Aranggak was also built in her memory. Every year, an event called Arangje is held on April 16 by the lunar calendar in Aranggak Pavilion. Young maidens dressed in white hanbok perform a religious ceremony to soothe the sorrow of Arang. There is also a saying that the spirit of Arang will preserve the love of those couples who visit the pavilion together.